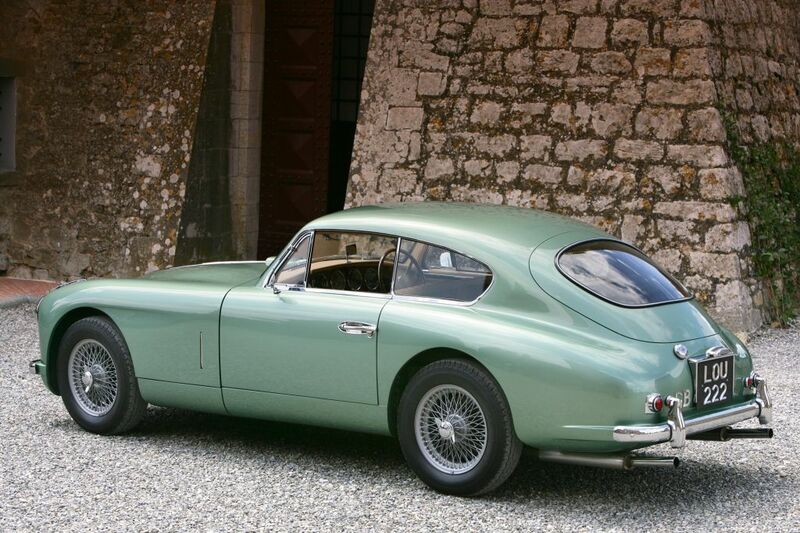 What you are looking at is a 1954 Aston Martin DB2/4 Mk I, and it will be up for auction in July at the Coys of Kensington auction house in England. Hidden within it are myriad specially-designed tools and gadgets, and you can be almost certain that this car is the genesis of 007's Astons — so it's no exaggeration to say this is one of the most influential cars ever made... and it's really a rally car. Originally, it belonged to a royal officer whose father headed up Britain's MI5. As it happens, his best friends were Ian Fleming's neighbors, and he frequently visited them while the author was writing Goldfinger, the first book in which James Bond drives an Aston. Squadron Leader Honourable Philip Cunfliffe-Lister DSO, or "Ingram" for short, absolutely loved partaking in rallies — hence the basis for most of the modifications — and he always brought his pride and joy with him to visit his friends. Coincidentally, Fleming was also an accomplished rallyer who often co-drove with men like Donald Healey (as in, Austin-Healey), so it's hardly surprising that when a state of the art, rally prepped Aston Martin DB2 parked next door, he took notice. After Ingram stopped driving the car, it somehow sat for decades, rotting away until a father and son thought it would be nice to restore an old classic. Once they started tearing into it they noticed a few things that weren't exactly factory stock. Like this special, heavy duty, anti-interference ignition. There is also a "concealed locker" and connections built into the driver's seat that work with both two-way radios and homing devices. Then, there's this: a Halda Speedpilot timing system that's used to make sure you end up at the right place at the right time... to the second. From a 007 perspective, this would help you get to a spot at the exact same time as, say, heavily-armed reinforcements, but it's also used very commonly in "time speed distance" rallying, where the goal is to get from point A to point B in a prescribed amount of time. All those fancy bumpers Bond always has? Look very closely here. The bumpers on a DB2 are not usually structurally reinforced, and they don't usually hold the tailpipes in place. Fleming was writing Goldfinger during the time this beauty kept showing up. Unfortunately, his passing in 1964 makes it impossible to be 100 percent certain about the car's real role in 007 lore, but it does seem like more than a coincidence that in Goldfinger, Bond switched from Bentleys to an Aston Martin with almost the same modifications as this one. So that's it, then: this is genesis. The original Bond car, driven by a military officer and the son of the head of MI5. And it was used for rallying. Aaron Miller is the Rides editor for Supercompressor. He's actually a little disappointed to learn that James Bond's car wasn't inspired by actual military spy vehicles, but he's thrilled that it had sporting intentions.